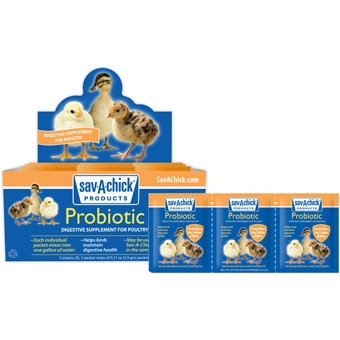 Convenient, pre-measured poultry probiotic supplement packets that mix into one gallon of drinking water. Promotes digestive health for birds newly received, during any kind of stress, and after antibiotic use, by supporting a high population of beneficial bacteria in the digestive tract. 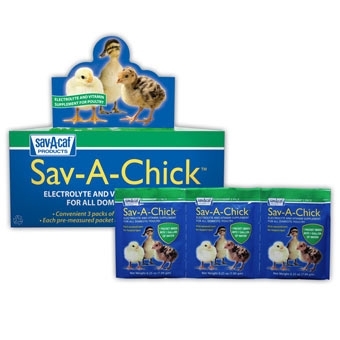 May be used alone or with Sav-A-Chick Electrolyte in the same waterer. 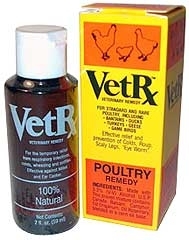 VetRx Vet Remedy for Poultry 2 oz. Effective relief from respiratory disease, CRD, roup, scaly leg mites, favus, eye worm for poultry, chickens, turkeys and game birds. Contains 3-1/4oz packs. 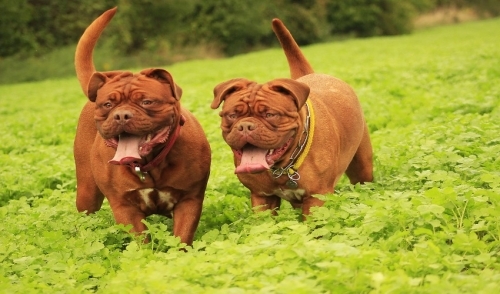 Electrolyte and vitamin supplement for all domestic poultry and waterfowl. Each convenient 1/4 oz packet mixes into 1 gallon of drinking water-no measuring required! Electrolytes help prevent dehydration, promoting proper blood pH, normal nerve and muscle function and overall health.